So recently, I've written about journals, and thank you notes. And pens. And to-do lists written on actual paper. And pretty paper and stamps and all those antiquated tools that produce actual paper with actual writing on them. In 2016 I may as well just admit that I'm a dinosaur. I mean, I love my technology as much as the next girl. I've got my Kindle (actually, I have a new Kindle that is still in the "to do" pile awaiting set up, but that's a topic for another day). I use my phone as a camera and a shopping mall and everything in between. I just fell in love with Peapod and when I do actually wander the aisles at the grocery store, I use their amazing scan-as-you-go device so I can even streamline my self check out. I'm happy to simplify when technology lets me do it. But in other areas of life, I'm on the other side. I'm happy to read books on my Kindle, but I like my magazines to be paper. I have a few bills online, but I insist on writing checks for most expenses. I love my phone and social media, but I make zero use of the calendar. I'm not kidding. Zero. I was emailing Adam some dates recently, and he told me to "just send him a calendar invite" and I had to admit that I've never used my Google calendar and wasn't exactly sure how to do that. When he tried to explain it, I basically said that I wasn't going to do that. I heart paper planners. BIG paper planners. Yes. I'm a weirdo. 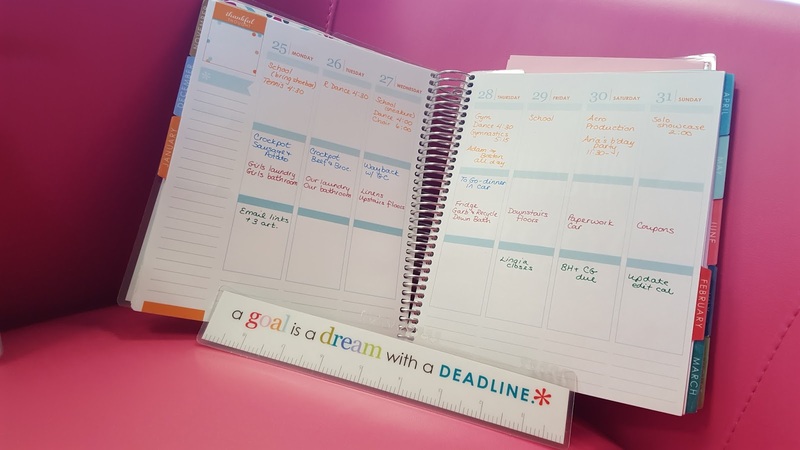 Ever since I got my first Erin Condren planner two years ago, I was in love and decided to never use anything else, even though my friends make fun of me when I pull my giant planner out of my giant mom purse. 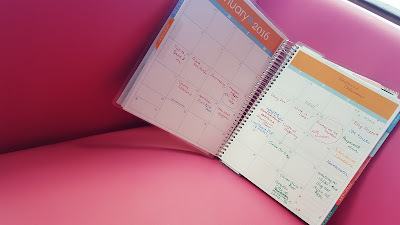 Here are the Top Eight Reasons, from the logical to the frivilous, for using a giant paper planner in 2016. Seriously. Have you looked? Really looked? They are so freaking cute. 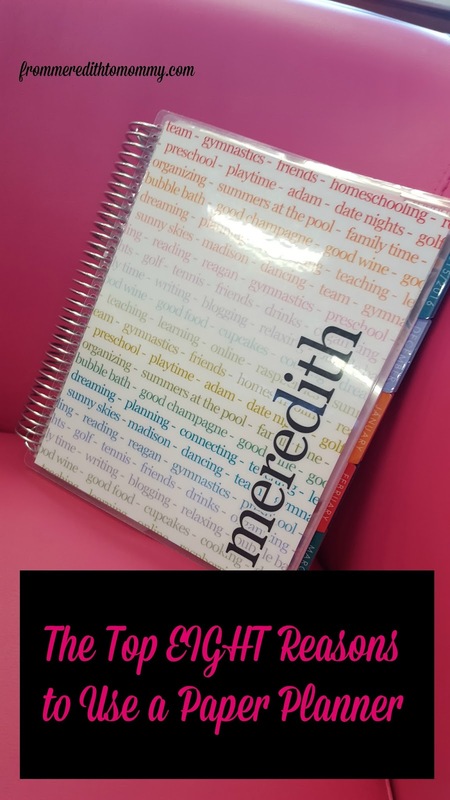 I've always gotten my name personalized on my life planner, but this year I went all out and the entire cover is personalized for me. 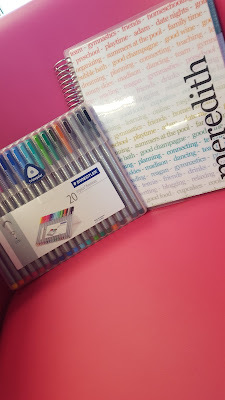 I made a list of my "favorite things" and those words are the background for my cover, scrolling across the planner in rainbow colors, reminding me of what I love. Just looking at my planner makes me happy. The organizing part of me LOVES this picture. SO PRETTY AND USEFUL. And don't even get me started on the accessories. Stickers. Pens. Washi tape. Matching writing pads. If I had unlimited disposable income or a gift card to Erin Condren, I could go crazy. My purse is a black hole. Appointment cards, preschool fliers, receipts for stuff that I'll probably return. Random papers that the girls leave their activities with. The advantage of my giant planner? Pockets. If I write something down that relied on a flier, I tuck the flier in the pocket and star the event. Once it's passed, I find the paper and recycle. But the actual paper is there when I need it. I'm not trying to find an attachment on an email. Digital shmigital. When I first started using these big planners, each day was divided into morning/afternoon/evening. A column for to-do and a column for notes. A good basic idea, but not how I used my planner. I had calendar stuff mixed in with what we were eating. So I started using stickers and personalizing what I needed in that planner. The days are still divided into three, but they aren't labeled. You figure out what you need. Generally speaking, mine go Calendar/Household (meal plan/daily chores)/To-Do (writing and other). I don't use the monthly calendar, but all the regular activities and the sporadic ones, along with Adam's travel are in that top third. The middle is where I keep track of our week, and the bottom is where I do all those other things. This is the beginning of next week. By Sunday it'll be a bit more cluttered. Basically? If you're tracking workouts? You can. Errands? Sure. School projects? Go for it. You aren't trying to fit into an app. It's paper. It can work for you. 5. They don't rely on a battery, a wifi signal, or a data plan. Right? Even if my battery dies or I get that scary text message that 75% of my data for the month has been used (before the month is 75% over), my planner is going to function just fine. And as much as I prefer my fancy pens, in a pinch, any writing utensil will do. Dinosaur for the organizing win. 4. They're the ultimate All in One. My meal plan. My to do list. My calendar. My bill due dates. My paperwork. My everything. Everything fits in my giant planner. This is how I plan out when to write. Does it always work? Nope, but at least I can SEE it. 3. They don't ask annoying questions. Here is what happens when I try to use an electronic organizing system. Open app. Select date. Select time. Select type. Type details on tiny keyboard that doesn't both me when I'm texting, but bothers me plenty when I'm dealing with a calendar. Then the app starts asking me questions. "Do you want a reminder?" "Do you want an email?" "Do you want push notifications?" Then someone asks me a question. Let's say they're wondering if we can do something after school, or what kind of tights we need for the jazz costume. Hold on, I think that'll work. Let me pull up my calendar. Then my task list. Then my to do for Wednesday. Subsection shopping. Wait, here's the picture I took of that flier with exactly what we need. Oh, hold on. App stopped. Force stop. Reboot. Enter password. 2. The act of writing helps me remember. When I was in college, I was an aural learner. If I was in class and actually listening, chances are I'd remember about 75-80% of the material. I have a crazy memory for that sort of thing. But when you're talking about a semester's worth of material appearing on a final exam, I did need to do some form of studying. And there was no way I was going to re-listen to an entire semester's worth of classes, so a recorder was out. What worked for me was both note taking and note copying. When I was an undergrad, a good amount of classes were the sort that allowed you to bring in one page of notes. That meant that I had to re-read and re-write my notes onto one page. By the time I did that the words were cemented into my brain. I barely glanced at that sheet again. The act of writing is a powerful tool for my memory. Therefore, when I write out my week in my planner, it's like my study session. Now I remember what we're having for dinner, what days are crazy and who needs to be where wearing what. When I don't write it down is when it flits right out of my brain. And typing, for whatever reason, isn't the same. Plus, you know, when I've dealt with all the app nonsense my brain has totally tuned out. 1. They're a perfect conversation starter. If I meet another planner person, we start talking about what kind of planner we have and what kind of planner we used to use and the pens and all of this stuff I already rambled on about. And if I meet someone who looks at me like I'm a crazy dinosaur, we start, well, talking about all this stuff I already rambled on about. Maybe they're like my husband, and they have a digital organizer that works for them and they can't imagine living without. Or maybe, they're a planner convert just waiting to happen. Surprisingly, this post was not sponsored by Erin Condren. If you buy via my link I get a referral bonus, but that's the same deal anyone in the world gets. I just really love these planners. You know, in case that wasn't clear.